I ordered the Chicken Leek Pie and Seafood Marinara pasta. 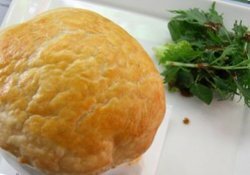 The chicken leek pie is superb as the chicken and leek was stewed till it is nice and soft. The gravy has absorbed the essence of the chicken and leek hence making it very rich and tasty and goes extremely well with the puff pastry. Next will be the Seafood Marinara pasta which is cooked pretty good and the texture of the pasta is just nice and the seafood ingredients are also fresh. The pasta also has a strong and sweet seafood taste and seafood lover will definitely like this. I will definitely come back again and highly recommended to try this ! !